March of Empires Become king in an MMO strategy game full of war, intrigue and conquest! 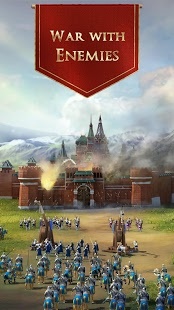 March of Empires is an app created by Gameloft (whose official website is http://www.gameloft.com/). March of Empires has a rating of 4.2 on the Play Store, with 158088 votes. Similar apps are: King of Avalon (by DIANDIAN INTERACTIVE HOLDING), Stick War: Legacy (by Max Games Studios), Dawn Of Titans (by NaturalMotionGames Ltd), Age of Sparta (by Gameloft), Forge of Empires (by InnoGames GmbH), Lords Mobile (by IGG.COM), Zombie Anarchy (by Gameloft), World at Arms (by Gameloft), Total Conquest (by Gameloft), Throne Rush (by NEXTERS), Clash of Kings (by Elex Wireless), Boom Beach (by Supercell), Clash Royale (by Supercell), Clash of Clans (by Supercell). March of Empires is currently available in the following countries: Peru, Switzerland, Romania, Israel, Turkey, Thailand, Germany, Japan, Denmark, Netherlands, Slovakia, Greece, Ukraine, United Arab Emirates, Poland, Estonia, Chile, Australia, Austria, Singapore, Indonesia, Czech Republic, South Korea, Colombia, United Kingdom, Serbia, France, Croatia, Sweden, Latvia, Lithuania, Finland, Norway, Hungary, Belgium, Hong Kong, Spain, Taiwan, Philippines, Russia, Malaysia, Bulgaria, India, Canada, Mexico, South Africa, Italy, Brazil, Portugal, Argentina, Saudi Arabia, United States, New Zealand, Egypt, Vietnam. Great news, my Lords! Update 11 is here! Assign titles to your most loyal subjects; let them rule the lands and reap some well-deserved rewards! Choose the diplomatic agreement that best serves your alliance's interests. Gather Materials to reinforce your Capitals. Invade other Realms while your Capitals have extra protection. Drive them away and win great new items. Unite the powers of men and gods to protect Ancient Greece!